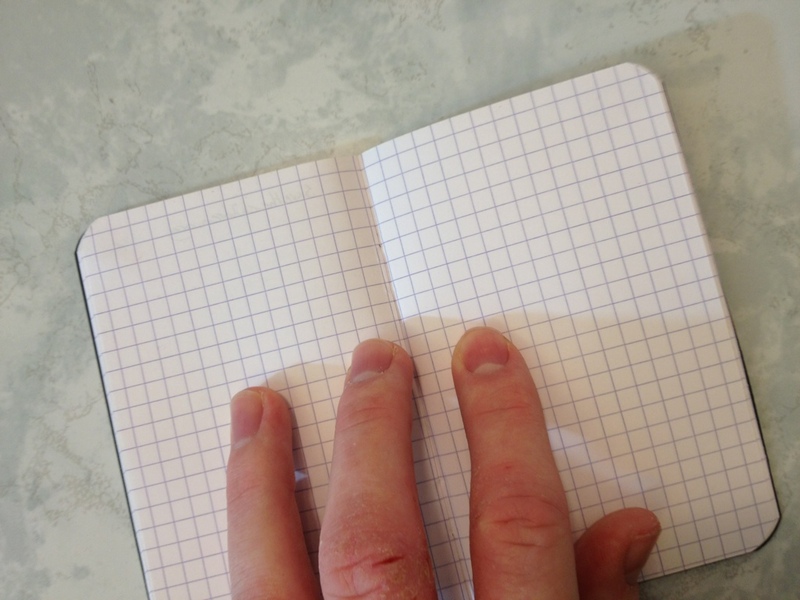 Pocket notebooks are something that, it seems to me, are becoming more of a “thing” again. Whether or not it was just me being unable to find them early in the 2000s, or them not existing in large quantities at the time, I don’t know. Still, I seem to find newer, and possibly better, pocket notebooks all the time, like the Rhodia 3×5 48-page 80g notebook I stumbled across at my local bookstore. The color of my notebook is black (it can be orange), with orange lettering printed on, making it look like the Rhodia premium pads, but it contains regular, stark white, 80g Rhodia paper. My particular book is a graph ruling in a light purple that is customary for the brand. I quite like it, but prefer a light blue for graphs. The 3×5″ size makes the book small and convenient to put in any pocket. Being a half-inch shorter on either side to a field notes book, I was surprised at the places this book could go that the latter couldn’t. The 48 pages are quite sufficient for making lists, a few sketches, or even a few stories, and about the right length to prevent the destruction of the book by the time it is completed. The cover quality is nice. It is thicker than the paper without being cumbersome, and seems tear- and crease-resistant, though I wouldn’t push it. The ink used to print the logo and info on the back is much more heavy-duty than what is used on the pads and holds up without smearing, chipping, or fading for quite some time. The staple binding is a weakness in some cases, being a bending point, but overall causes little damage since the size is so small. 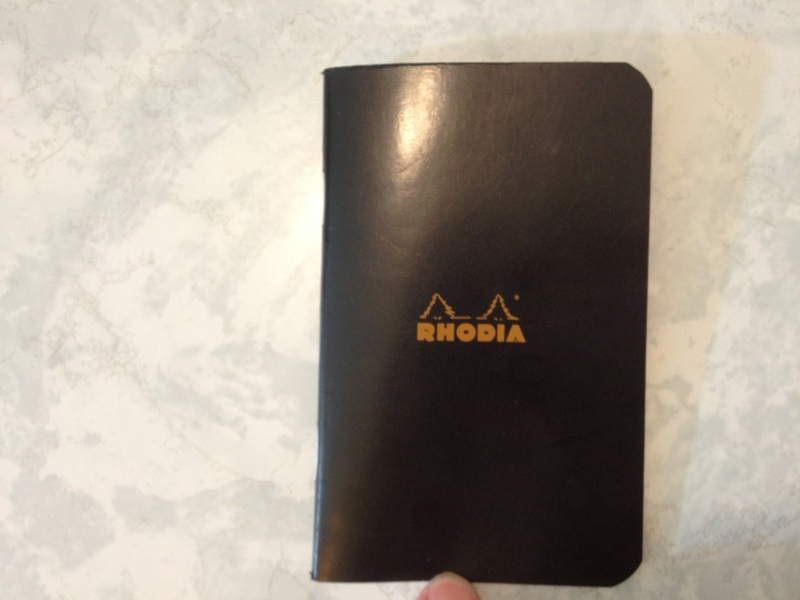 And the paper is typical wonderful Rhodia. It is thick and smooth, taking everything from pencils to fountain pens with no problem. It is an absolute pleasure to write on, though with some liquid inks taking time to dry, one has to be careful. If they are looking for speed, a non-liquid pen should be looked into, but even ballpoints feel great on the paper. Bleed-through and feathering are minimal. Show-through is unfortunately common, and tearing is unlikely but possible if the book is going out on an adventure. Overall, these little notebooks are a great addition to the pocket notebook collection. They are heavy lifters for their size, and the black ones are fairly covert and classic looking. And, of course, they all but disappear in a pocket. A great little book to look into especially if you think Field Notes are just slightly too large. This entry was posted in Advanced Supplies, Consumables and tagged 48, 48 pages, bound, fountain pens, nice fountain pens, pocket notebook, review, rhodia, small pages, staple bound by Dragon Co (Austin Smith). Bookmark the permalink.